If there is a single car on sale today that actively discourages ownership due to the way it looks, it’s probably the Honda Civic Type R. But let’s be honest, if it looked even half attractive, the Honda Civic Type R would almost be too good to be true, because this is quite simply the finest hot hatchback that has been on sale since the VW Golf GTI Clubsport S and Renault Sport Megane R26.R before it. The astonishing thing is that it nearly does without compromise. The Golf and Megane were intense. No back seats, trackday-spec rubber, reduced sound deadening, caged and fitted with plastic windows in the case of the Renault, but the Civic has everything, a big boot, spacious rear seats, a stunning primary and secondary ride despite the 30-section tyres that we’ll come back to later. In short, the Civic Type R doesn’t feel like a hot hatchback, but a superbly engineered sports car that just happens to be front-wheel drive. As a leader of front-drive performance car development in the 90s with models like the DC2 Integra Type R and Prelude, it’s remarkably fitting that Honda fill this niche in 2019. 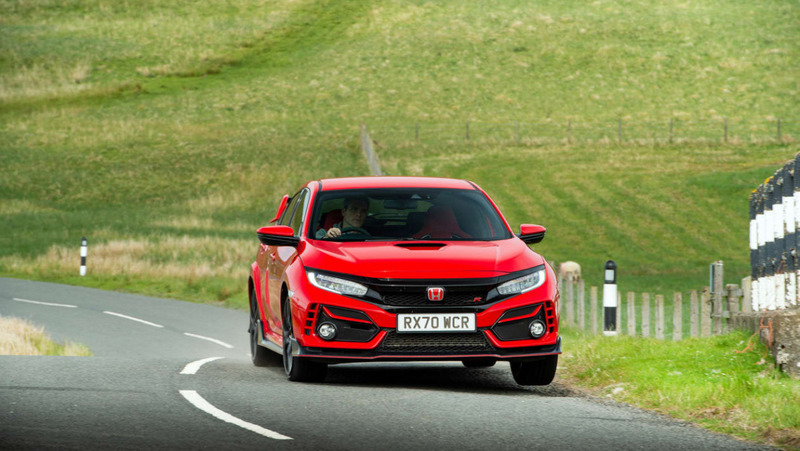 Don’t lament the turbo-charged engine, bloated proportions or flaky interior if you’re a VTEC die-hard either, just enjoy the Type R’s uncanny ability to constantly surprise, delight and amaze. It’s that bloody good. Starting at $41,280 for the well-equipped entry-level model, all the Type R’s performance paraphernalia comes standard including 20-inch wheels, Alcantara bucket seats, LED headlights and that arresting body kit. Drop another $2600 on the GT pack and you’ll get dual-zone climate control, front and rear parking sensors, sat nav and blind spot monitoring – desirable, but not essential additions in other words. As with many Japanese cars, the options list is short, with only various exterior carbonfibre components threatening to rid you of yet more hard earned cash at the dealer. Closing in on $45k might sound like a lot of money, and indeed it’s priced higher than cars like the i30 N Performance and Golf GTI, but the Honda is a far more complete and capable performance car, with far more speed and sophistication where it counts. The Renault Megane RS Trophy is currently the most closely matched in terms of power, performance and capability. Priced at $54,015, it’s priced at the same point as the standard Civic, but fit essential options like the Recaro buckets and a reversing camera and it quickly exceeds the GT in terms of pricing. Its 297bhp power figure is also down on the Civic, and lacks adaptive dampers to quell the Renault’s incredibly firm ride. The Volkswagen Golf R is a more polished and introverted hot hatch, but don’t mistake those dowdy looks for a lack of potency, despite WLTP emissions regulations forcing both a power drop from 306bhp to 296bhp and the discontinuation of the manual gearbox option. At $45,680 in five-door form it’s quite a bit more to buy, although the VW’s options list can quickly raise that number. 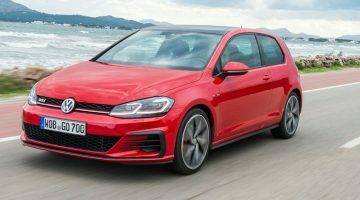 The VW group’s other offerings, in the form of the SEAT Leon Cupra 300 and Audi S3, could also be considered at $39,900 and $46,850 respectively. One of the few elements carried over from the old car is the engine and gearbox. The 2-litre unit now develops an extra 10bhp, mainly through work on the mapping side of things and reducing back pressure in the exhaust. 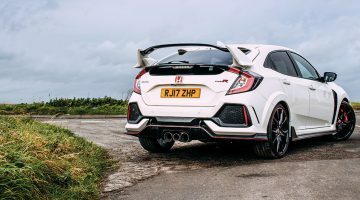 Honda might not have chased the ultimate power output in the class, but let’s be fair, there’s nothing puny about 316bhp, particularly given that at 1,380kg the Type R is significantly lighter, for example, than a Ford Focus RS (1,524kg). So despite the obvious disadvantage of three pedals and a gear lever versus a twin clutch ‘box when ranged against the stopwatch, and the traction limitations of front-wheel drive (although the Civic’s lack of wheel scrabble and torque steer is almost otherwordly), the Civic’s 0-62 time of 5.7 seconds is entirely respectable, and edges out a manual Seat Leon Cupra 300 by two tenths of a second. The 2-litre turbocharged four-cylinder engine that underpins the Civic Type R is the same basic unit found in the previous generation car. Fundamentally a relatively conventional engine, the 1996cc DOHC four cylinder utilises both VTEC variable valve timing and a high capacity single scroll turbocharger to produce its 316bhp and 295lb ft of torque. It’s available on a plateau of revs between 2500-4500rpm, it is the torque’s spread in the rev range that provides the biggest point of contrast against Honda’s previous Type R engines. The unit itself features direct fuel injection, cast alloy pistons, forged conrods, and what Honda refers to as a lightweight crankshaft. The engine itself isn’t totally free of lag, catch it off-guard and it can take some time to wake up, but once its lungs are full, the Civic fires you down the road at almost ridiculous rate. The acceleration barely wanes at high engine speeds too, with a satisfying hard rev-cutout if you do brush the limiter. There wasn’t much wrong with the gearshift in the FK2 – it was one of our favourite aspects of the car – but it’s been further refined here with also a lower final drive ratio. Drive is once again deployed through a helical limited slip differential to the front wheels. In short, nothing like what you’re probably expecting, at least initially. And why would you think any differently, when your eye is drawn to madcap elements like the Vortex Generators that jutt from the rear of the Type R’s roof like a bristling porcupine. However, it takes just a few hundred metres to feel the massive improvement in ride comfort compared to before. In this regard, the Type R is now no more difficult to live with than any other hot hatch, particularly when put in the Comfort setting, which allows the dampers a surprising amount of stroke to deal with poor surfaces. Sport is also well judged, but combined with much crisper throttle response, while even the +R mode is now perfectly useable on the road if you’re in the right mood. Sometimes – just for a moment – you find yourself forgetting entirely you’re driving something that looks quite so dramatic, it really is that much more refined in every respect. The FK8 Civic’s interior is a major step on from the old car, and crucially for a hot hatch, all the really important interior bits in the Type R are spot on: great bucket seats, good pedal weighting including the brake, the tactile alloy gear knob and a lovely, slim, leather steering wheel. It’s an environment that immediately sets the right tone for driving. All the laggy behaviour and awkward resonances of the old engine have been banished. It pulls cleanly and strongly from around 2,500rpm, then maintains that vigour unwaveringly to the 7,000rpm red line. The switch to a single mass flywheel (compared to the dual mass setup of before), along with the much improved calibration, means that throttle response is sharp, the revs rising and falling notably swiftly, for example, when the clutch is in. It’s an honest, energetic powerplant, with a breathy exhaust roar similar to an old Megane RS and no hint of electronic fakery to the induction rort. When you find the right road, and really go for it, the Type R’s character crystallizes into something viciously hard-edged. The steering is very precise, and the variable ratio now means steering is mainly via your wrists, rather than armfuls of lock. It’s not dripping with feel, but neither does it ever register as being a hindrance to establishing a good rapport with the car. 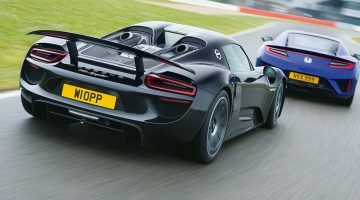 It is now far more poised, and it is more stable, and ruthlessly fast across the ground, summoning tremendous levels of grip, turning in with real keenness and begging the driver to push harder. And those 20-inch wheels. Well, aside from their relative delicacy over rough roads and kerbs, the ride remains incredibly well calibrated, supple yet taut (to fall into that motoring journalism cliche), an impressive example of Honda’s final calibration capability. This is all the more impressive when you find there is barely enough sidewall on those 30-section tyres to brand them. That such a small sidewall can contain the Civic’s huge lateral load without total deformation is utter witchcraft. It does all of this yet combines it with the traditional thrills of manual cog shifting and busy footwork, because the best bits of the Type R are when you’re revving the blazes out of it, feeling the front diff working with the front suspension, rather than despite it, to distribute the torque and steering inputs in one suave movement. Rarely, if ever before, has a front wheel drive car felt so assured, so incredibly polished when handling so much power. It’ll oversteer on turn in if provoked with the brakes, but its default setting is grip, grip, and more grip. It’s a big car – every time you climb out of look at it, particularly in profile, it seems more like a sports saloon than a ‘hot hatch’ – and occasionally feels it, trading a smaller hatch’s hyperactive agility for a more grown-up effectiveness, but that shouldn’t be read that the experience is in any way dull. It’s a 272kph riot. Aside from the obvious performance gains, the turbocharged engine is also more economical than its naturally aspirated forebears, on paper at least, as the combined rating of 7.7L/100km make owning a three hundred plus brake horsepower hot hatch easier to justify. Unfortunately, rivals like the Golf R and Audi S3 both crack the 7.1L/100km mark when combined with a dual clutch gearbox, so although impressive, the Civic is by no means the most efficient in the class. Much like the exterior, the interior has been completely redesigned, and rather than repeating another one of Honda’s controversial twin binnacle design, the new Civic Type R harbours a far more grown up and ergonomically sound layout. Shared with the standard Civic, the overall dash design is more conservative, but well thought out and surprisingly good quality. The lowered seats and raised centre console give the interior a more cocooned feeling, making you feel like you are sitting in the car, rather than on top of it. The wider body unlocks extra shoulder room, and although the rear is less kid friendly thanks to room taken up by the multi-link rear suspension, the boot is big and commodious – far larger than most in the class. Honda’s infotainment system is a drain on the senses however, not adhering to the law of the volume knob. The system is a little slow to respond, while the Garmin-based sat nav looks low rent compared to systems found in the Golf R and Audi S3. But this is still a Type R at the end of the day, meaning red bucket seats, colour coded stitching, red accents on the dash and the crucial magnesium gear knob are all present and correct. The ultra hot hatch is rarely interested in such mundane things as subtlety, but compared to even the outlandish Focus RS, the Civic Type R has taken aggressive styling to another level. The foundation for all this visual chaos is an equally complex base car, with standard model Civics looking super aggressive, even in lowly three-cylinder form. The all-new hatchback body is based off a new global Civic saloon, which has influenced the longer, lower silhouette. Honda’s recent exterior design language is based around a new grill motif, which is spreading rapidly throughout the Honda range. In some standard trims this is a massive chrome slab, which connects the headlights and grill together, but in Type R trim is mercifully painted black. From there however the whole design gets increasingly complex, with a scoop in the bonnet, widened wheel arches, huge (mostly fake) front intakes and that enormous rear wing. Cast you eye on the roof and you’ll also see some strange humps running from front to rear, these Honda says, are vortex generators, cleaning up the airflow before reaching the rear wing. Below the tailgate, triple exhaust tips (curiously similar to those seen on the Ferrari 458 Italia) finish off the rear treatment. The overall effect is, arresting you could say, and make garish rivals look subtle and subtle rivals invisible. Whether the looks sweeten or sour the whole car is up to the individual, but at least you would never lose it in a car park.